Modern log home w/ easy access to private dock. Golf course nearby. Looking for the perfect escape to rewind, enjoy the outdoors, and spend quality time with family? Look no further than 'Powder Mill Lodge', conveniently located in LaFollette, Tenn. near Deerfield Resort and Springs Dock Marina. 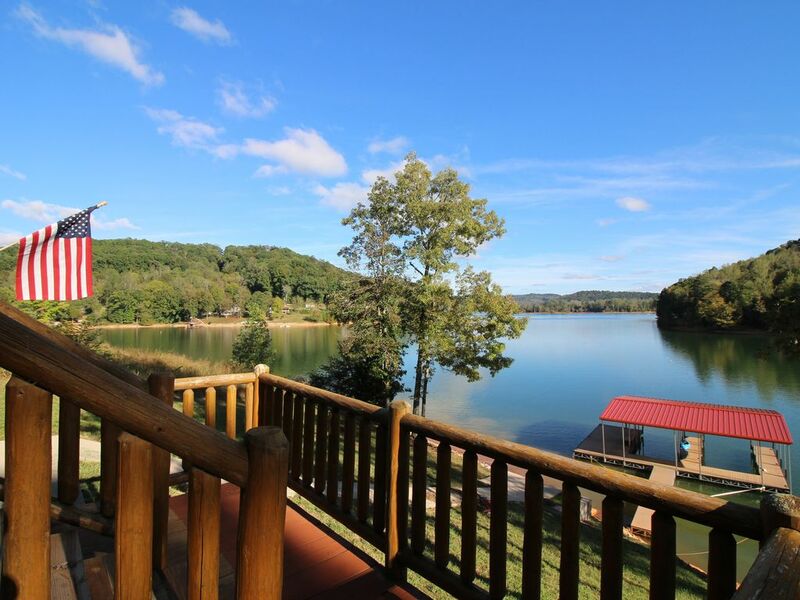 The moment you arrive, the driveway opens up to sprawling views of Norris Lake and your custom Jim Barna Log Home. Relax on the large deck or venture down the gently sloping lawn toward the double-slip dock with plenty of room for hanging out and watching the little ones swim. The open concept kitchen makes family dinners a breeze and the lake views make the wine taste that much sweeter. The spacious gathering area gives multiple families ample room, Wi-Fi access keeps you connected, and satellite TV has the kids under control. As the sun rises, sip on a cup of joe as the fog lifts off the water. Powder Mill Lodge is located across from point 11 in deep water, allowing for quick access to main lake skiing, boating, fishing, and much more! As the sun sets, return from your last minute boat cruise to a craftsman style grill & smoker for a mouthwatering feast. Dinner settles best under the open sky by the outdoor fire-pit with breathtaking views. This is a brand new rental and will book quickly so act now! The Otto family provides us a rare, gentle slope just off the busy waterway of Norris Lake Powel River area. Even though the swimmers enjoy quiet water, the open ski water is 1 minute away. 2 marinas are around the corner and golf is a few miles away. What more can you ask for? The decks overlooking the lake provide the ultimate relaxation area. Watch the kids swim all day long and enjoy evening smores over the fire pit. All bathrooms supplied with bath towels, wash cloths, and hand towels.